Some fruit contains high levels of natural sugar and so works very well as a sweetener in sugar free recipes. It is essential, however, to use the right fruit in the right way, in order to ensure the dish is sweet enough and cooks, bakes or mixes up successfully. Bananas, apricots and sweet apples work well. 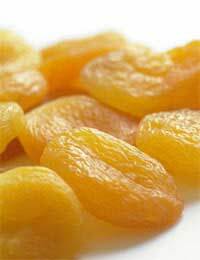 Dried fruit can also be soaked or gently cooked and used as a sweetener. Sometimes fruit ought to be stewed before use. At other times it can be used raw. This sugar free recipe works best with dried apricots. Fresh can be used too but you may need a larger quantity. Fresh apricots don’t need to be soaked but still ought to be stewed for a few minutes. Soak your dried apricots overnight in your 500ml of water. Preheat your oven to 180 deg C/ 350 deg F/gas mark four. Pour your apricots and water into a medium saucepan and bring to the boil. Gently simmer for 10 minutes. Then liquidise. Beat butter into apricots. Add your beaten eggs. Then your flour. Spoon into a greased cake tin and bake for about 25 minutes or until golden and a skewer comes out cleanly. Cool and then top with cream cheese. This recipe is wonderful when you need to whip up a quick sugar free pudding. Sweet apples from the fruit bowl will work well. Don’t worry if they’ve started to go a little wrinkly. Peel, core and slice your sweet apples. Cover with boiling water from the kettle and simmer until soft. In a large bowl, whip your margarine until creamy. Then stir in beaten eggs. Add soft stewed apples and apple juice. Mix until there are no lumps. Sieve self-raising flour into bowl and stir. Spoon into a greased microwaveable dish and cook in the microwave at a medium temperature until risen and a skewer comes up clean. The length of time needed for this stage will vary, depending on the power of your microwave. Serve while still hot with a dollop of whipped cream. This is another delicious recipe. In many ways it is similar to a cheesecake or traditional custard pie. Preheat your oven to 150 deg C/140 deg C/gas mark two. Make your pastry first by forking one tbsp of your plain flour, plus your warm water, into your margarine, to create a paste. Once smooth, slowly add the rest of the flour until you have a pastry that is suitable for rolling out. Wrap the pastry ball in cling film and place in the fridge to chill for about an hour. Meanwhile, mash or blend your bananas, eggs and cream cheese. When firm, unwrap your pastry and roll out on a lightly floured surface. Grease a 20cm pie tin and cut out a circle that is slightly larger than the tin. Line your tin with the pastry circle. Bake blind for about five minutes then remove from heat. Spoon your banana mixture in. Replace in the oven and bake in the centre of the oven for about half an hour until your pie has risen and is firm on top. It may feel slightly wobbly beneath. Remove from the heat, leave to cool and serve with cream and chopped banana.